Get lucky. 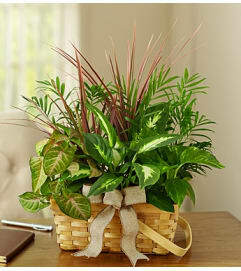 Give Lucky! 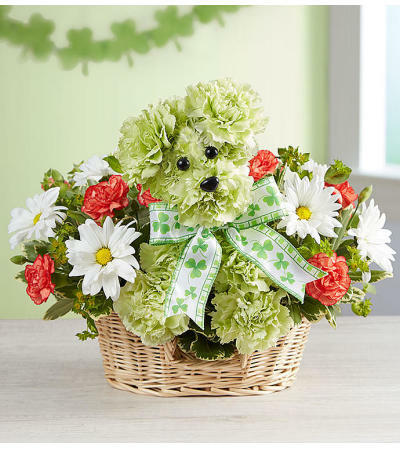 Our signature St. Patrick’s Day pup is party-ready, hand-crafted from traditional green, white and orange blooms, and wearing a fun shamrock ribbon. He’s a truly original surprise to make Irish eyes of all ages smile. 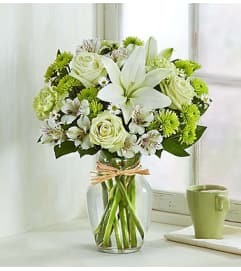 Hand-designed, truly original floral arrangement of lime green carnations, white poms and variegated pittosporum.